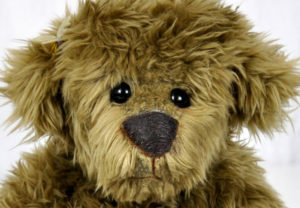 Handmade OOAK Teddy Bears for Sale Online! Now on display are our new authentic line of Handmade Teddy Bears named “Gunther.” They stand 14 inches tall and have jointed limbs for posing the head, arms, and legs. The bears are stuffed with poly-fil, and plastic pellets are added to create a nice even weight. They come with either 100% felt or real leather paw and foot pads. 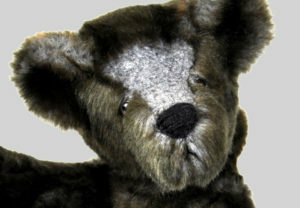 Each bear is individually hand crafted, American made, and one-of-a-kind (OOAK). If you have questions about any of our teddy bears, please ask on our Contact Page. 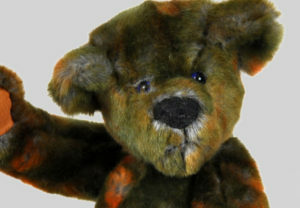 Handmade OOAK Teddy Bear with jointed limbs for posing the head, arms, and legs for sale online. Gunther Classic Teddy Bear with poseable limbs. Gunther Outback Teddy Bear with Leather Paws.